Amanda’s note: I offer you another post from Carol Little of Studio Botanica. Carol is about as bananas over edible flowers as anyone I’ve ever met and she suggested we need a post here on violets, a favorite spring time flower. 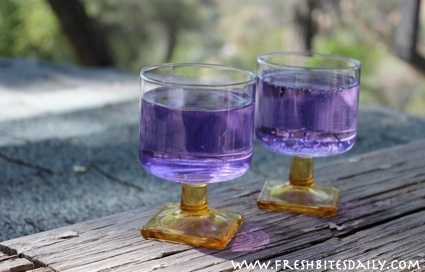 We do not have mountains of violets in our area and so I was intrigued at Carol’s idea on how to enjoy them in syrup form. If you have a violet bounty, this is a “must-try” activity. Violets are cherished. Sweet faces. Do you know that there are about 450 members of the viola family? Each member is edible: Both the leaves and flowers can add a delicate flavour to your meals. I love violets. You will hear me say that about many of our green nation. It’s hard not to smile when you see a patch of violets, isn’t it? We can toss the flowers in a spring salad. Indeed, the leaves bring a gentle counterpoint to a seasonal salad with dandelion and arugula greens. We can brew a simple tea or steam the greens to enjoy with a drizzle of sesame oil or with other wild edibles such as nettles, mustard greens, or chickweed. We can create an enchanting herbal charmer with this easy to make syrup, which is sure to delight your family. This is a traditional herbal syrup recipe ~ today featuring our lady ‘Viola’! Harvest violets by gently pinching them right off at the top of the stems. Pinch the green parts at the base of the violets (the calyxes) and twist the petals free. Save the petals and compost the calyxes. Notes: Use white sugar only if you want to create a colourful product. Also, if your water is alkaline (hard), you can add lemon juice to get the blue colour, but you’ll lose the delicate flavour of the violets. I’ve been told that some people use distilled water as an option. Put the violet petals into a glass canning jar or a stainless steel food storage container. Whatever you decide to use, make it a non-reactive, heatproof container. Do not use aluminum or any sort of plastic container. Add the water to a small stainless steel or glass pot and bring to a boil. Pour the hot water over the violet petals. Pour the liquid and the petals into the top of a double boiler. Alternatively, make your own ‘bain marie’ and use a stainless steel or glass bowl atop a pot with 2 inches of water in it. Pour the violets and the infusion into this bowl. Stir constantly and ensure that the sugar is completely dissolved. Strain the syrup through a fine sieve to remove the violets. Let the syrup cool to room temperature then transfer to glass jars. Make sure to add labels with Violet Syrup and the date. It’s really best to store the syrup in the fridge to preserve it as best as possible. Violet flower syrup will keep, refrigerated, for at least 6 months. Make a sorbet with an ice cream machine. Sinfully delightful? Create a festive cocktail with vodka, club soda or Perrier and a little violet syrup! Reminder: If you have any extra violets? Freeze them in ice-cubes for an “over the top” presentation garnish for summer beverages al Fresco! More about violets? There’s more to this pretty face than beauty. 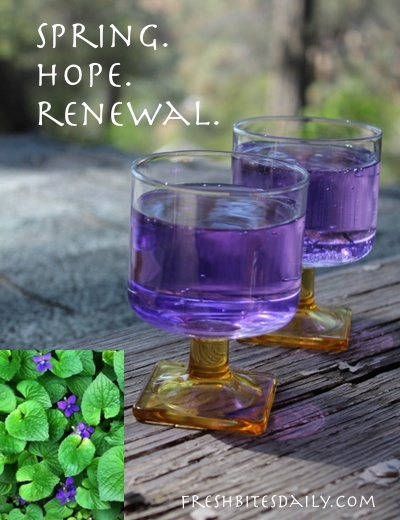 Read more about violet medicine at my site Studio Botanica.